Please pass on this information to anyone you think might be interested. And also check out the other offerings this big, 25th year! Dancemaster Steve Weintraub posted this to his blog a couple of weeks ago. It sparked some good discussion on the Jewish-Music list and should be shared (and discussed) more widely, I think. Greg Wall/Carolyn Dorfman Dance company at Brandeis U. Everyone knows Rabbi Greg Wall, one of the amazing jazz sax players of our time. I first met him through his work with Frank London in Hasidic New Wave, but was subsequently blown away by his "Later Prophets" recording (not to mention work with KlezmerFest, or the amazing variety of music hosted at his Sixth Street Synagogue in NYC). So, when Greg, who spends part of his summer teaching music to high school students at a Brandeis University summer program wrote me last week to mention that someone of whom I had never heard, the "Carolyn Dorfman Dance Company" was appearing that night and that some of his music would be featured, I had to be there. No one will take it amiss or unusual if I say that Wall's music, while incredible, was not the highlight of the evening. It was the incredible fluidity and inventiveness of the dance and the dancers as they performed three pieces from a collection created by Dorfman over the last decade, sometimes collaborating with Wall on the music, called "The Legacy Project." Judy and I were just back from Jacob's Pillow, in the Berkshires, where we had seen an okay Cuban dance troupe--good enough--but nothing compared to what we saw Wednesday night (and the fact that Dorfman hasn't been invited to Jacob's Pillow, given the comparison, speaks quite poorly of the Berkshire-based dance festival). I have to post my amazement, astonishment, and pleasure at the evening, which took us from a dance that seemed to celebrate life in Europe prior to the Holocaust, then life in the Camps, and then, slowly, Tikun, a healing of sorts. We were further treated to Ms. Dorfman introducing each piece briefly before it played, as the dancers changed costumes and had a couple of minutes to drink some water in the hot, hot evening. Many thanks to the Dorfman Dance Company, and to Carolyn Dorfman and Greg Wall for an extraordinary evening. …. I am researching jewish music for composing porpouses. Every year in México city they make this jewish dance festival called Festival Aviv. I was choosen to compose music for a group, so my research goes from history to the deep investigation of traditional jewish music. I was wondering if you have any information about jewish typical musical instruments. I need to know everything about instruments before i start composing. I would appreciate it very much. Here's the link to festival aviv: "Han pasado ya 35 años de danza y emociones en el Festival Aviv Carlos Halpert de Danza Judia en Mexico—Video producido para conmemorar esta XXXV edicion "
Part 1 of the Sunday night dance at Temple Beth Israel Center, Sunday April 19th, 2009, Madison Wisconsin. 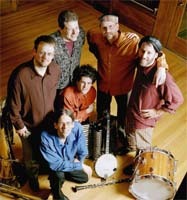 The Kamp was led by UW Artist In Residence Henry Sapoznik, who was still at the movie "His People" when the band started. Aaron Alexander on drums, Dan Blacksberg on trombone, Josh Horowitz on button accordion, Mark Rubin on bass and tuba, Cookie Segelstein on fiddle and Michael Winograd on clarinet. The dances were led by Steve Weintraub. I filmed until my arm grew sore and my feet refused to stay still. So I put down my camera and joined the dance! Itzik Gottesman reported to the Jewish-Music list his sadness that Pearl Lang had passed away suddenly on February 24, 2009. "One unforgettable moment with Pearl Lang—I was an actor in the National Yiddish Theater production of The Dybbuk in 1981 and at an early rehearsal Pearl, the choreographer, came over to us, me and 3 older Yiddish actors in their 70s, maybe even their 80s, and said to us in Yiddish 'Show me what you can do' and with no music playing they just spontaneously combusted into ecstatic Hassidic dance movements jumping and prancing all around the room. It was such a beautiful but surreal site to behold. Then after a minute, Pearl said, 'OK, I got it'." Steve Weintrab adds: "It really is a great loss to the dance world. I studied with her briefly when she taught at the Alvin Ailey school in the 80's. And I had the honor and pleasure of performing for her and Felix (thanks to you, Itzik) at the Congress for Jewish Culture benefit honoring them both. She was a talented and tough woman, its a shame to have lost her. "I just spoke with Joanne Borts, who remembers her from when she choreographed Golden Land (for Broadway?) May her memory be for a blessing." Judith Brin Ingber wrote a moving obituary to Pearl Lang, original published in the Jewish Week. It is now available on the Jewish Women's Archive in their "We Remember" section. There is a full biography in the archive's Jewish Women's Encyclopedia. Sounds like the workshop was well received. Get ready to dance at your great grandparents' wedding! Join Hankus Netsky, clarinetist Dena Ressler, and dance caller Judy Bressler and learn line, circle, and set dances from the "Old Country"! Join in the fun and learn dances such as the Freylakhs, Bulgar, Hora, and Sher! This workshop is co-sponsored by the Boston Workmen's Circle. Shirim Klezmer Orchestra @ The Lilypad on Mar. 29, 2009! Shirim Klezmer Orchestra, masters of the klezmer universe, perform a fun and infectious concert of klezmer and beyond on Mar. 29, 2:00pm at the Lilypad, 1353 Cambridge St., Inman Square, Cambridge, MA . Suggested donation, $10, $7/kids. Bring the kids, bring your grandmother! Be ready to move. This is music for the soul. Albuquerque, New Mexico USA, January 7th, 2009 -- The Southwest’s 7th Celebration of Klezmer Music and Dance-- KLEZMERQUERQUE 2009-- presents 4 days of concerts, dance parties, classes and workshops featuring the world-renowned Strauss/Warschauer Klezmer Duo—Deborah Strauss and Jeff Warschauer; the acclaimed dancer, choreographer, dance scholar and historian Judith Brin Ingber, as well as many local artists. ‘Klezmer’ is the music and dance of the Jewish people of Eastern Europe which is currently enjoying a revival in the world music scene as well as in popular music and culture. The annual festival will take place from February 12-15 (Thursday evening through Sunday afternoon) at Albuquerque’s Congregation Nahalat Shalom which is located on 3606 Rio Grande Blvd. NW (between Candelaria & Griegos). "Tanzhoyz" live and well in Germany; Boston next? Currently there are "Tanzhoyzer" listed in Berlin, Bonn, Karlsruhe, Nuremberg, Offenbach and Vienna. Chag Sameach everyone. I'm very happy to announce that Chicago now joins NYC and the Bay Area in what I may dare to call the "Tanzhoyz Movement". (Who's next, I wonder) I'll be hosting monthly Yiddish dance parties with live music! Here's to getting those dances back into the community. Wish us luck! The new two volume YIVO Encyclopedia of Jews in Eastern Europe, published by Yale University press, has just been issued. It is an inspiring accomplishment with invaluable text and fine illustrations. Dance in covered from pages 387-392, comprising three articles. The overview and Traditional Dance are written by Walter Zev Feldman and Theatrical Dance by Judith Brin Ingber. There are some cross-references also. It is a recommended resource. or via the dance-song page, www.yiddishdance.com/tantslieder.html (original Yiddish can be accessed from this page). Yiddish Dance Action Network: Calling All Zamlers! *Zamler is the Yiddish word for compiler. Zamlers gather together scattered things in order to form a collection. For years I have contended (and others, more effectual—they've even gotten this symposium together) that reviving klezmer without reviving the dance makes incomplete sense. Dance music without dancers is decontextualized in the extreme. More Yiddish Dance in NYC! New Yiddish Dance Class at NY's 92 St. Y presented by Center for Traditional Music and Dance and the 92 St. Y.
CTMD announces a new partnership with Manhattan's 92 St Y to offer a series of Yiddish dance classes beginning in September led by Walter Zev Feldman and other master dance leaders. Building on our monthly Tantshoyz (dance house) series at the JCC in Manhattan, the 92 St. Y classes will provide intermediate and advanced dancers with a more in-depth opportunity to explore classic Yiddish and coterritorial dances such as the sher, hora/zhok, freylekhs, honga, hora moldavaneasca and bulgar. Special focus will also be given to the expressive power and gestures of solo dance. Classes will feature live klezmer music performed by Jake Shulman-Ment on violin and Pete Rushefsky on tsimbl (hammered dulcimer). There are many wonderful photos from Yiddish Summer Weimar online at www.yiddish-summer-weimar.de Click on 'Diashow'. 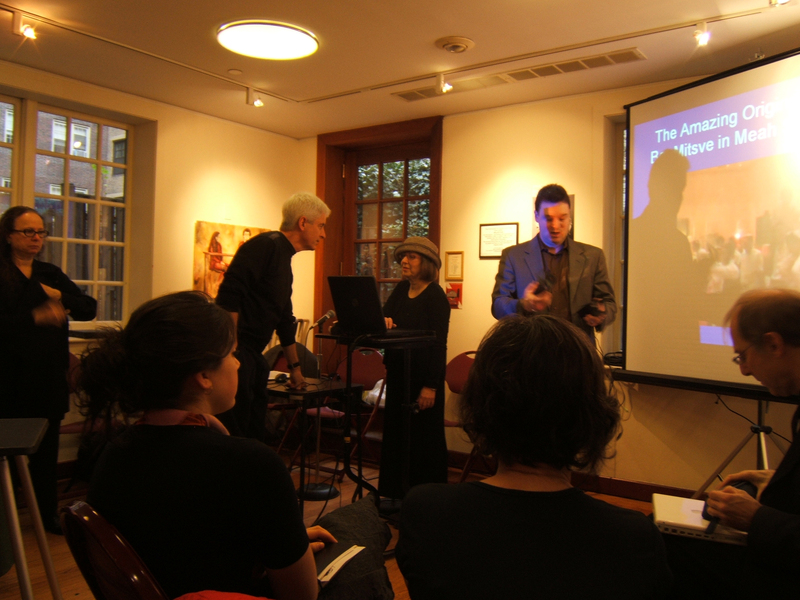 The workshops are still running—currently featuring Lorin Sklamberg, Pesakh Fiszman and others. Broiges tanz - on film! The video clip of the broiges tants requires the most recent version of Quick Time to view it. This dance happened quite by accident as I had not planned to do it but Judith started playing and singing it earlier in the evening and we decided to include it at the last minute. My dance partner, Judy Silver had never seen a broiges tants before so it was very improvised and spontaneous. I welcome all information that people might have about this dance from past years, as I am accumulating a collection of people's recollections elsewhere on my web site. At the Skirball Center for Adult Jewish Learning, we have an 8-week course on the history of klezmer beginning in October. Here is a description of the course. For centuries, klezmer music was the soundtrack to Jewish life in Eastern Europe. In the twentieth century, klezmer went through a wild series of twists and turns, disappearing and reappearing in the most surprising cultural combinations and locations. In America, klezmer arrived with immigrants and collided with American popular music before virtually disappearing following World War II. Now, in the past few decades, klezmer has become an international musical sensation with the most unlikely of influences, including jazz, reggae, and hip hop. Follow the fantastic history of klezmer music and listen your way through a century of amazing, often obscure, recordings. If anyone has any additions or comments, please email Helen Winkler. The tour will include 11 days of visits to local villages and folk dancers, ethnographic museums, dance performances, castles, folk restaurants, dance instruction and lots of sightseeing, arranged with the assistance of Marin Barbu. Now we have finished the program and the website of the 12th "Days of the Jewish Culture in Chemnitz/Germany". It is a various program not only with klezmer; we have reading, a radio feature, danceworkshop, theatre.... The website is only in German but it is translatable with altavista and other web-translation-services. As usual, we invite attendees to post comments here, during and after the event. Back in October, 2002, on Columbus Day weekend, several of us made our ways to Franconia, NH, where we learned (or in my case, tried to learn) traditional Jewish Dance taught by Zev Feldman. It has taken a while to find the time to put some stories and pictures together, but it was a special weekend, and I am glad that this is finally up. Thanks to Judith Pinnolis, Dena Ressler, Helen Winkler, and Jacob Bloom who took the pictures and wrote the words, along with me. "Two Yiddish Dances" -- Settings by Nathan Vizonsky, as taught by Miriam Rochlin. What dances go with Klezmer Music? After all, "Klezmer" IS dance music! This 48 minute video teaches a Freylekh and two variations of the Sher. It also looks at the life and circumstances that helped give Yiddish dance it's unique flavor and style. Narrated and produced Karen Goodman, the dances are taught by Miriam Rochlin who studied with Polish-born dancer/choreographer Nathan Vizonsky in the 1950s. Documentary/Instructional video:48 min $24.98. Available at: Hatikvah Music, (323) 655-7083. Ever since I was bitten by the klezmer bug a few years ago, all I wanted was to have the opportunity to attend a Yiddish dance workshop. My first plan to attend had to be cancelled due to serious illness in the family; a few months later though, I was ecstatic to discover that the Manitoba International Folk Dance Association (MIFDA) had decided to host a klez dance event in Winnipeg, with instructor Steve Weintraub of KlezKamp fame. Although once again illness threatened to prevent my attending, with the help of supportive friends, on November 23, 2001, I found myself on a plane bound for the Peg as it's called.